Achenbach, a veteran reporter for The Washington Post and acclaimed science writer for National Geographic, moves beyond the blame game and tells the gripping story of what it was like, behind the scenes, moment by moment, in the struggle to kill Macondo. Here are the controversies, the miscalculations, the frustrations, and ultimately the technical triumphs of men and women worked out of sight and around the clock for months to find a way to plug the well. 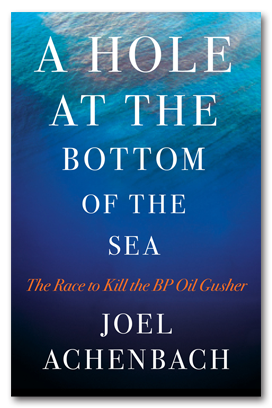 The Deepwater Horizon disaster was a kind of environmental 9/11, polluting much of the gulf and throwing the country’s political leaders into a crisis for which they had no immediate solution. The government did not have the means to solve the problem; only the private sector had the tools, and it didn’t have the right ones for a blowout in the deep. The oil spill, in the memorable words of the National Incident Commander, Adm. Thad Allen, was “indeterminate” and “asymmetrical” and “anomalous.” The country became haunted by Macondo’s black plume, a gusher that became omnipresent on TV and the Internet, seemingly mocking the efforts to kill it. Human beings could not venture to these depths; remotely operated vehicles, the spaceships of the deep, had to perform the challenging technical maneuvers at the sea floor. Back in Houston, engineers choreographed this robotic ballet and crammed years of innovation into a single summer. 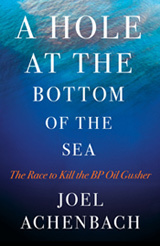 As he tracks the drama in Houston, Achenbach details the government investigation into what went wrong in the deep sea. This was a confounding mystery, an engineering whodunit. How did experienced workers on an acclaimed rig find themselves facing the ultimate nightmare of the “oil patch”? The lessons of the tragedy, it turns out, can be applied broadly to all complex enterprises, and should make readers look more closely at the highly engineered society that surrounds us. In presenting the story of the Deepwater Horizon and the struggle to kill the well, Achenbach has written a cautionary tale that doubles as a technological thriller.